Recycle Night - Recycle Right! Your recycling is sorted 'by hand' by People with disability in Wagga Wagga, Cootamundra and Tumut. That's why it's so important that we all take a little extra care with what we put in our recycling bins! Welcome to Recycle Night? Recycle Right! Every fortnight we do it. Close the lid on our recycling bin, wheel it out to the kerb, and... forget about it. Somehow we've become removed from the rest of the story. Sure, the recycling truck makes its way down the street, lifting bins high into the air as bottles and cartons crash, bang and rattle their way down into the truck. When the truck fills up, it returns to your local recycling facility (known as MRFs) where a bob cat scoops the contents onto a conveyor belt, from there your recycling is hand-sorted by a fantastic group of hard-working, enthusiastic and friendly workers. In Wagga Wagga, Tumut and Cootamundra, MRFs are operated by three locally-based disability support organisations: Kurrajong Recycling, Valmar and Elouera Association Inc.
Each employee is unique, but there's a few things that they all have in common - and that's the purpose the job brings to their lives, how happy they are to be there, and how proud they are of the role they play within the community that benefits the environment. Important: PEOPLE WHO WORK AT THE MRFS HAVE TO HANDLE the contents of your recycling bin. Including: The smell of rotten food that has been sitting around for weeks. Dirty nappies. Needles. Dead animals. Household junk. Rubbish. The stuff that wouldn't fit in your other bins that you thought you would just toss in the recycling one to get rid of it. When using your recycling bin, think about how your actions might impact on the people who process your recycling. The danger of needle stick injuries when used needles find their way into the bin or the contamination caused when food is put into the bin that rots and smells. Everyone wants to recycle right, wants to be sure that what they put in the bin is the right thing. What to put in, what to leave out. But when all MRFs do things a little bit differently, we all need a little help to do it right on recycle night. Keep reading to discover the stories of our MRF employees, tips and tricks for recycling, and where to get more information. Aaron is 21 and works at Kurrajong Recycling in Wagga Wagga. He catches the bus daily from Ganmain where he lives with his grandmother. Anthony works at Cootamundra Recycling for the Elouera Association Inc. and is part of a fantastic team that includes Lorraine, Fonz and more. 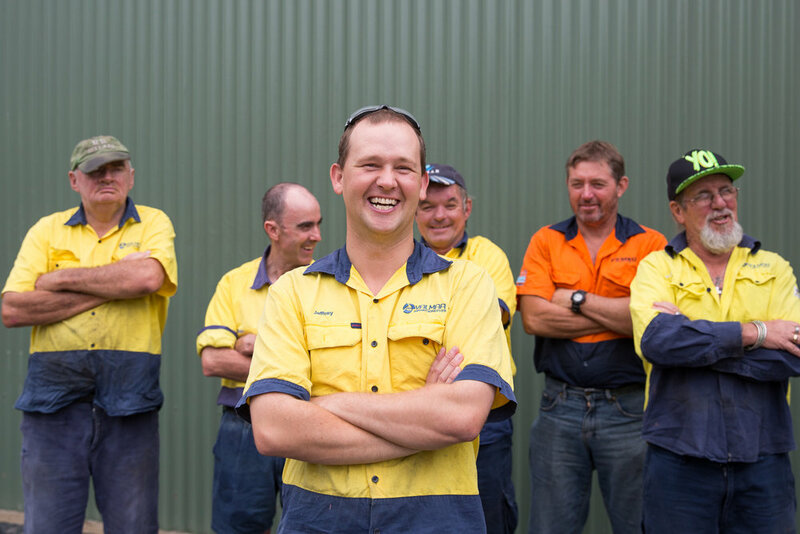 Jeffrey has worked at Tumut Recycling for Valmar Support Services for 8 years. Jeff recently got his P-plates, he drives to work every day. Each MRF is different, and CAN accept or not accept, different ITEMS. To HELP them and the planet, make sure you’re aware of what your MRF can recycle. Quick Tips for Recycling Right! Food scraps is the number one contamination issue in recycling. Please make sure there is no food or oil remaining in any recycling or it can ruin the whole load! It doesn’t have to be spotlessly clean, but if it has permanent food stuck in it, then do not put it in the recycle bin. Always keep your recycling out of plastic bags. Only drop individual items in the bin. It might seem tidier to put the containers into a bag and then the bin but what it means is that nothing in the bag is recycled because MRFs cannot open the bags and sort through the waste. One of the best tips to help recycle is to have a bin in the house. Things go straight into the bin, and then you know that all of those things can be recycled. You might struggle to find a good spot for it to fit initially, but it will make the process much easier. Take our 5-question quiz to see how much you know!